Specifically designed for use on turf grass. It will provide necessary nutrients for tolerating environmental conditions such as high temperature and drought, while offering improved vigor, color and root-density. 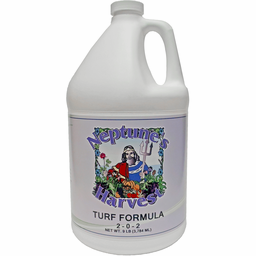 Made with fresh North Atlantic fish and seaweed, we recommend using Neptune’s Harvest Turf Formula for all of your outdoor needs. Directions: Shake well before use. Apply as directed below. Ingredients: Hydrolyzed Fish, Molasses, Seaweed (Ascophyllum Nodosum), Humate, and Yucca Extract.